It was not a great day to be a gardener. It was definitely not a gloating day, a day when I have to resist calling friends at their offices desks and hold my phone to the air, shouting “hear the birds, hear the breeze, hear the sea!”. On the contrary, it was a day when a microwaved pasty, an unlimited supply of coffee and some idle gossip by the photocopier would have been welcome. Perhaps not, on reflection, I think I will tough it out after all. 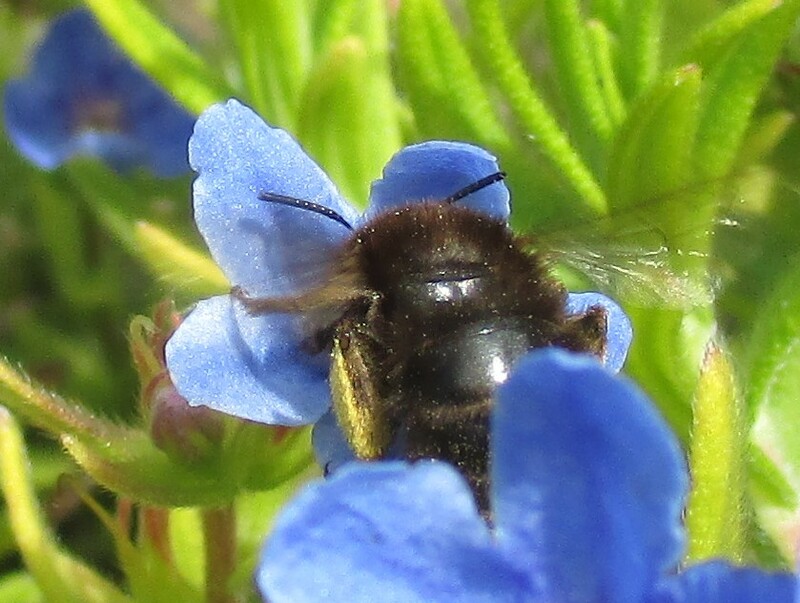 Like myself, this pollen laden bee supping from a lithodora flower was most likely in hiding today. Our day will come, my little friend, they have promised. I sorted through files and chucked out lots of miscellaneous tat that I had been saving for some reason. I feel cleansed! This morning I anticipated a wash-out, but we were so very lucky, it was our social group garden visit to Tapeley Park this afternoon and the sun came out as we arrived, just as well as the outing venue was my idea. Better weather arriving soon I have heard. I lost my mojo a bit yesterday as it was drizzling constantly and the wind was unrelenting. A precious day lost but back on it today. Wishing for sun for you and me! It worked! A beautiful day today, hope you got outside to enjoy it. I’m going up to the allotment today to see if my fruit cage is still there or if it’s been blown away. Sunny today at least! Fabulous photo–I love the bee! I too have been shivering for the past two days from low-50s daytime temps (it was in the mid to high 80s a week ago — honest, really and truly it was!!). It’s all my fault, of course: on Sunday I took the two warm blankets off the bed, washed them, and put them tidily away. On Monday the temperatures plummeted. It is so variable, it is difficult to know what to wear. Back to loveliness today, thank goodness! Gorgeous photo, I thought it was a blue poppy at first. Now that would have made me jealous. Thank you, not a poppy but a good blue all the same.